This month’s Daring Bakers’ Challenge took us on a trip to beautiful Brazil! 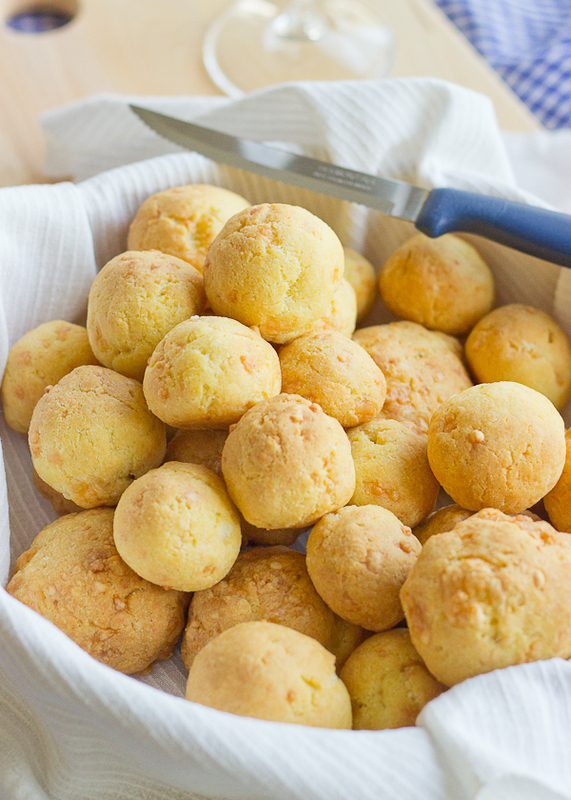 Renata of “Testado, Provado & Aprovado!” taught us how to make Pao De Queijo, tasty cheese buns that make the perfect snack or treat, and that will make your taste buds samba! Ah, the Daring Bakers! Always a challenge! This month I really thought that there will be no fuss with the executions of the task. But who am I kidding, everything is difficult where I live. The supply of products is scarce and every exotic ingredient requires some serious research to be found. You should have been here to see the faces of the sales persons when I was looking for tapioca… The risen eyebrows, the confused expressions, the “Are you crazy?” look in their eyes…Priceless! If I was looking for moon dust the result would have been basically the same. Bulgaria is a small country, with clear food habits, and new and unfamiliar products are very difficult to track down. And that’s normal: there is no demand, then why should there be a supply? Anyway, there isn’t any tapioca flour here, but I found tapioca pearls. There was a little struggle grinding it, since the food processor was only tickling the small hard pearls, but the coffee grinder helped a lot. I am so glad I did this recipe! 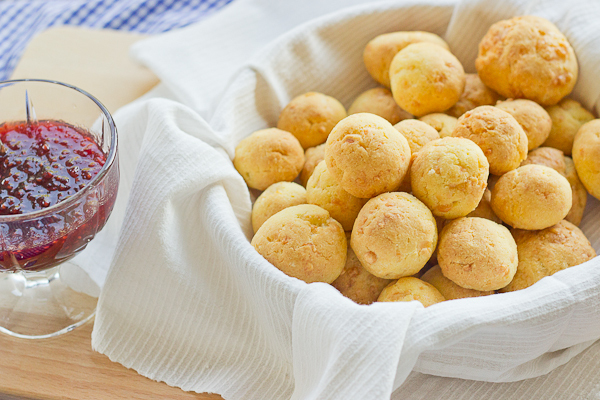 The Brazilian bread is something everyone should have access to! I was sure that the Brazilians knew how to devour life, but their bread reinforced my opinion. It is soft and light, it melts in your mouth and it has nothing in common with any other bread that I have tried. If you can get your hands on some tapioca I strongly recommend trying this no-fuss bread, which delivers so much. Renata said that the Brazilians love it with coffee, but some how I understood wine. Ain’t it funny how the mind wonders? 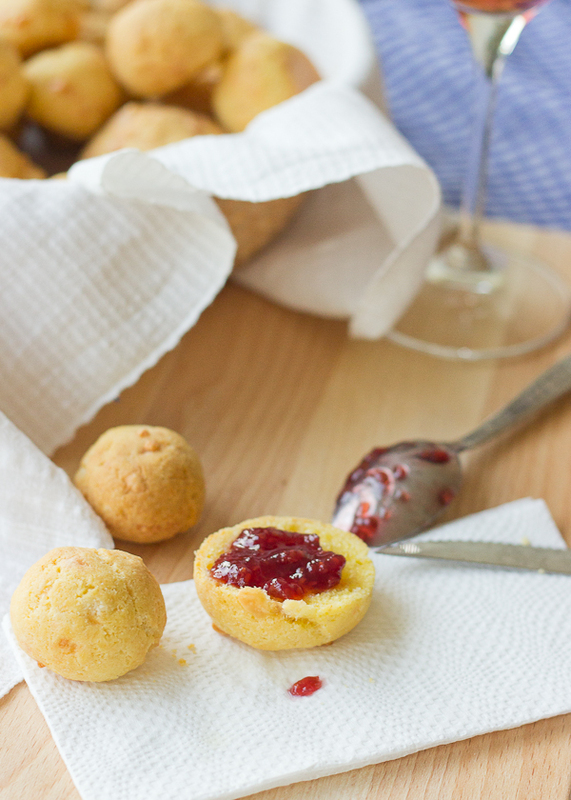 And also, wine and cheesy bread pair so well with berry jam. Don’t you think? Maybe you don’t… but this is an absolute truth in my world. 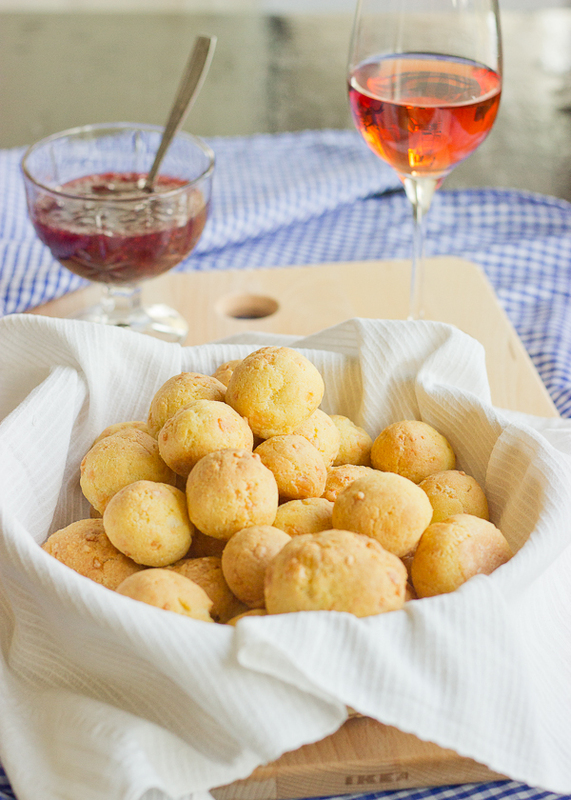 Cheesy Brazilian bread, that uses tapioca flour as a main ingredient and produces light and fluffy buns that melt in your mouth. Preheat your oven to 200° C/400° F.
Start by placing the milk, butter and salt in a small heavy bottom saucepan. Put over medium high heat and bring to a boil, stirring frequently. Sift the tapioca starch in a large bowl and pour the hot milk over it. Mix thoroughly using a wooden spoon or a fork. The mixture will be dry at this point. Start adding the eggs, one by one, kneading with your hands after each one. Last, add the grated cheese and knead to incorporate. 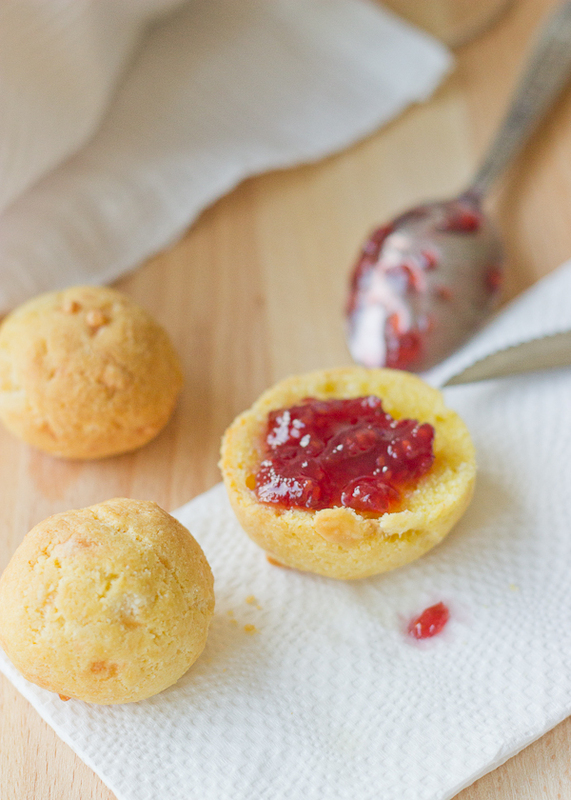 Form small bowl from your dough and place them on a baking tray, lined with parchment paper. I love the idea of these, especially along with the jam and the wine! I live in england and I’ve never seen tapioca flour here, not that I’ve ever been looking, so it might not just be Bulgaria. I’ll definitely have to see what I can find to try and make some of these. Any excuse for a glass of rose! Maybe we are too far from the its homeland. You should try these. The things we do for wine… Thank you for stopping by! Beautiful, beautiful, beautiful!! Hats off to you for doing such a great job in finding the ingredients and improvising so cleverly! 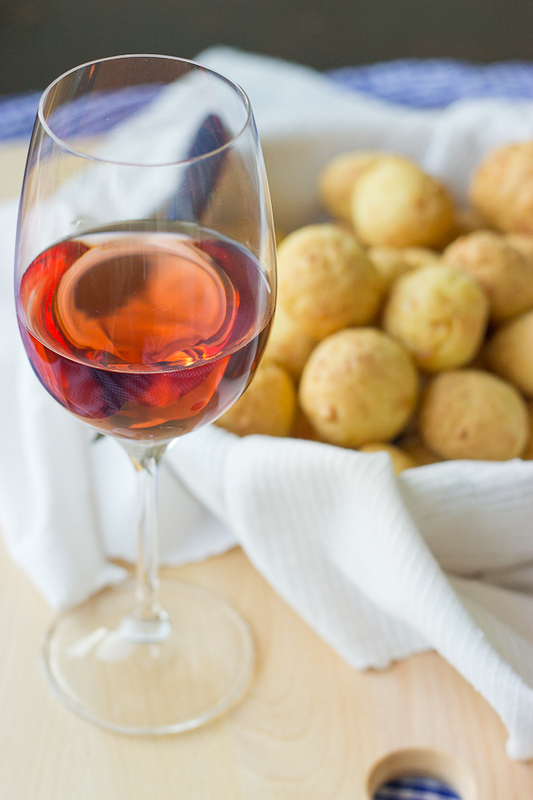 I love your shots, and yes, pão de queijo pairs very well with wine! Thank you so much for joining in! Glad you enjoyed it! Thank you, Renata! It was a wonderful challenge and a real pleasure!